I don't normally pop in here twice a week but on Tuesday I shared this homemade harissa recipe and I couldn't leave you all the way until next week to share a recipe you can use it in. So here we are twice in one week (spoiler I might be doing the same thing next week as I am sharing a recipe for preserved lemons (beyond easy people) and a creamy coconut milk chicken bake that may or may not include harissa again, because two recipes is always better than one), don't worry this won't happen very often, truthfully I am quite boring and really you don't need to be reading my random musings much more than once a week. Also if you follow me on Instagram then you might be confused as to when those roasted strawberry muffins might be hitting the blog, that I have been promising and promising are coming up each week and then like the girl that I am I completely change my mind and give you something else. Well after next week (because I am seriously excited about that dish) they will be up. It is not that they are better or worse than these other recipes I am excited about every single one of them I just wanted to give you a couple of harissa options because I hate it when you go and make a condiment or sauce and then you can't think of anything to use it in and then it just sits in the fridge and goes bad and the second it goes bad is when you find something else to make with it and then you have to restart all over again. 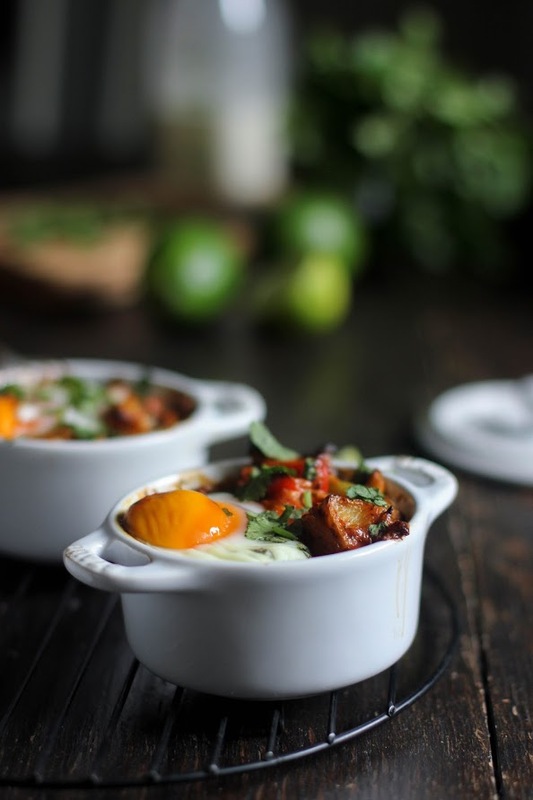 These harissa baked eggs are extremely easy to whip up in the morning. They are truly packed with so much flavour (thank you harissa) I don't even think the hubby or kids will realize they are loaded with veggies too! I am pretty lucky because with my hubby it is the more veggies the happier, go figure. You could add a sausage or even bacon to the dish but I kept it simple and meat free. It is really a very homey dish, that is how I like to cook the majority of my dishes with that warm, makes you feel cozy and makes you wanting more feelings. I hope that is how they come across anyhow. If you don't have the small cocottes you can easily make this in one big oven safe pan, that is probably actually easier and also what I would do normally. But these were cute and make for pretty pictures, just don't be fooled into thinking this is what breakfast looks like every morning around here. Most of the time it is messy and not exactly photo worthy but really taste is all that matters and these eggs have that. The filling can also be made the night before and then all you have to do in the morning is crack some eggs on top and throw them in the oven. The spice factor of the harissa is taken down quite a bit by the addition of the cream so it is not overpowering (thinking of those sensitive morning tummies) but it does give you a nice pep in your step. I feel like a little spiciness in the morning can make you feel like you can take on the world, so the more the merrier over here. Plus it gives that metabolism that giant boost and who doesn't need that sometimes? You can also make this dish vegan by substituting the cream for coconut milk (taking out the goat cheese as well) and instead of eggs adding some chickpeas to the veggie mixture. Just bake it all the same way and add the fresh herbs on top afterwards and a squeeze of lime. Chop the sweet potato into small bite sizes along with the pepper, broccoli and onion. Place the sweet potato, pepper and onion in a large oven safe pan and toss with the olive oil and butter. Bake the sweet potatoes, pepper and onion for 20 minutes and then add the broccoli and bake for another 15 minutes. Once the potatoes are soft and browned take the pan out of the oven and add in the cream, harissa and goat cheese and mix it all together. Next crack four eggs on top and bake for another 18-20 minutes or until the eggs are done to your liking. Serve garnished with cilantro, salt and pepper and a squeeze of lime. 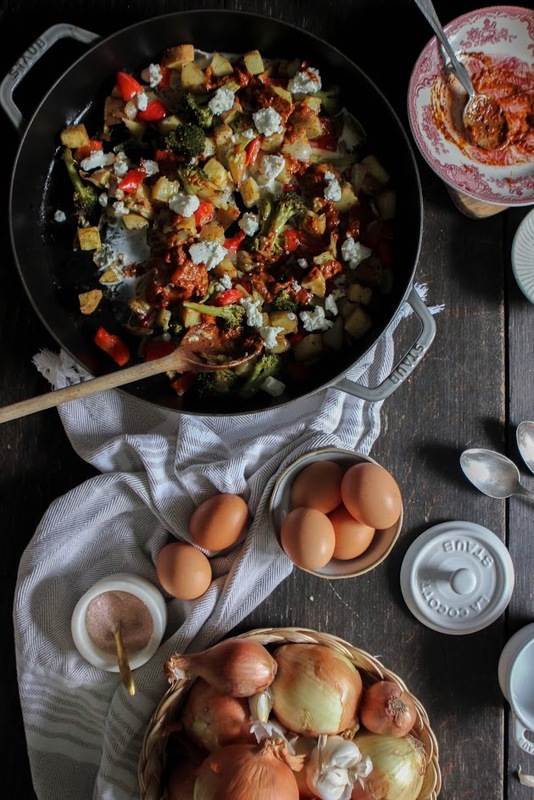 You can add sausage or bacon to the dish if you like or you can also make it vegan by substituting the cream for coconut milk (taking out the goat cheese as well) and adding chickpeas to the veggie mixture instead of eggs.